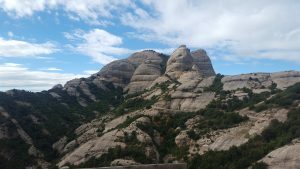 Last weekend the SAI Barcelona family traveled to Montserrat for the day. 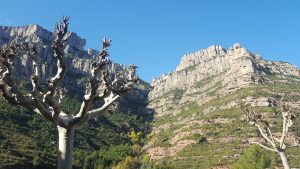 It is located west of Barcelona taking us an hour to arrive at the base of the mountain. 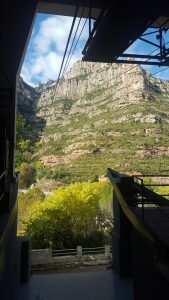 The train to Montserrat leaves once every hour from Placa d’Espanya, therefore, it is important to be punctual! 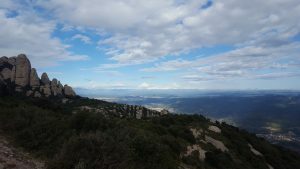 The sheer beauty of Montserrat left me wanting to come back and conquer the highest peak, Sant Jeroni (1,236 meters). This mountain range is not only home to the beautiful terrain. The Santa Maria de Montserrat Abbey notable for enshrining the image of the Virgin of Montserrat lies at highest point reachable by the railcar. 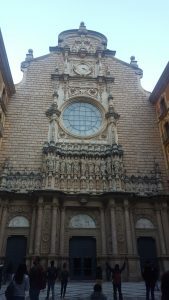 Accompanying the abbey is the Basilica of Montserrat and inside you can find a statue of the Virgin herself. She is holding a sphere symbolizing the universe. Visitors from all over the world wait their turn to have a moment with the Virgin of Montserrat while touching the sphere. Our group decided to wait in line and partake in the spiritual experience. It eventually became my turn to walk up the steps and rest my hand on the sphere. This spiritual experience offered me a moment of peace and solidarity, reminding me to live more in harmony with the universe. Enjoying Mato cheese with honey! 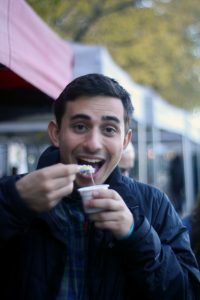 Gabriel is an SAI Barcelona fall 2018 student from Colorado State University.